The first Latter-day Saint missionaries arrived in Mexico in 1875. They divided into two groups. One sent selections of the Book of Mormon in Spanish to influential leaders throughout the country and taught many people, but they had no converts. The other group baptized Mexico’s first five members of the Church, in Hermosillo, Sonora. Four years later, one of the leaders who had received the Church literature in 1875, Plotino C. Rhodakanaty of Mexico City, requested baptism for himself and others. By 1885 a Spanish translation of the Book of Mormon was completed. For many years the country faced political tension, but the early members remained faithful. The first Spanish-speaking stake in the Church, the Mexico Stake, was organized on December 3, 1961. The Church opened several schools, including Benemérito de las Américas, founded in Mexico City in 1963, which is still in operation. The first temple built in Mexico, located in Mexico City, was dedicated in 1983. 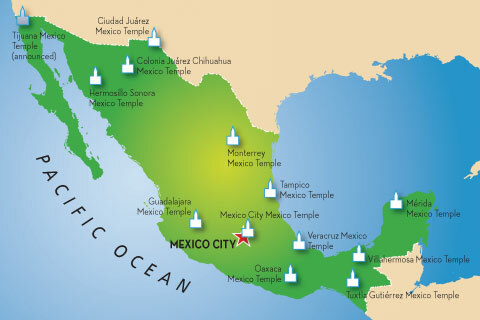 In 2000, eight temples were dedicated in Mexico. In 2004, Mexico became the first country outside the United States to have one million members. Church leaders participate in the groundbreaking for Benemérito de las Américas on November 4, 1963.